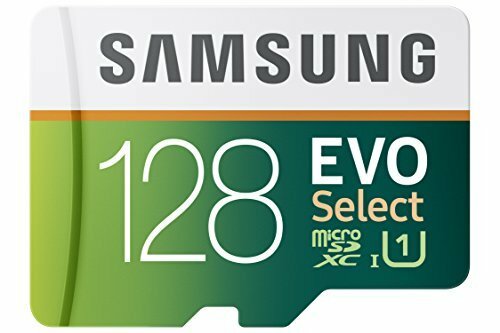 Get the most out of your smartphone or tablet PC with Samsung's EVO Select 128GB micro SDXC Memory Card. This high-performance memory card features read speeds of up to 80MB/s for transferring music, photos, and videos and is UHS-1 enabled to capture Full HD video. Waterproof, temperature proof, magnet proof, and X-ray proof, this reliable memory card ensures your files remain safe during life's little mishaps. An included SD adapter lets you use the card with your digital camera, laptop, or desktop computer. Works with Cell phones, Smartphones, Android Tablets, Tablet PCs, and more. High-performance up to 80MB/s for full HD video recording, high resolution pictures, mobile gaming, music and more. View More In Micro SD Cards.